The COOL'15 Workshop International Organization Committee has given Accelerator Division Head Sergei Nagaitsev the Dieter Möhl Medal. The medal, sponsored by CERN, is given for pioneering work in the construction of the first high-energy electron cooler and its application to the cooling and accumulation of antiprotons at the Fermilab Recycler Ring, contributing to the significant increase in the integrated luminosity recorded in the Tevatron during Run II. 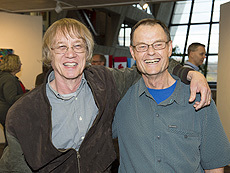 The Dieter Möhl Medal recognizes accelerator scientists for their lifetime achievements and recent important contributions to the field of beam cooling and their applications. 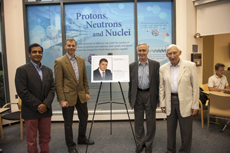 This year the medal was given to two scientists: Nagaitsev and Alexander Skrinsky of Budker INP. Dieter Möhl, who lived from 1936–2012, was an accelerator physicist of world renown. He made essential contributions to many projects at CERN and around the world. 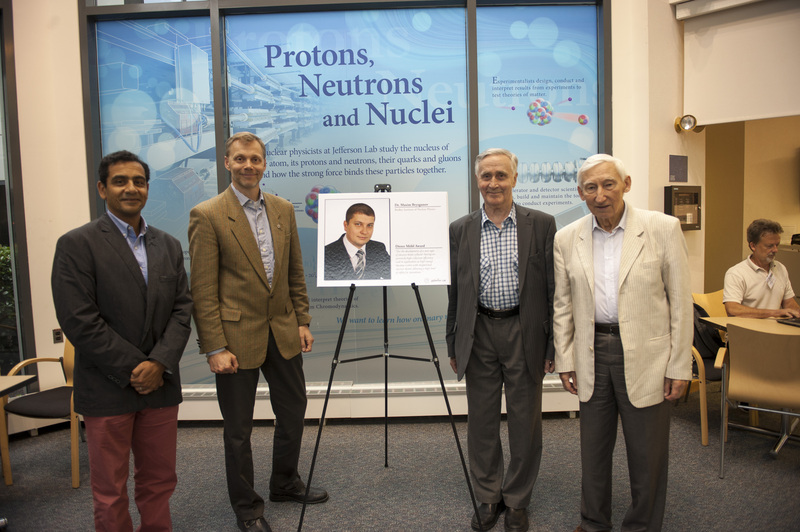 Fermilab congratulates Nagaitsev for his great achievements in the field of beam cooling. The Education Office is now accepting nominations for this year's Director's Award for exceptional volunteer service, funded by Fermilab Friends for Science Education. Each year, more than 200 employees, users and contractors go above and beyond their everyday duties to further outreach and education at the laboratory. 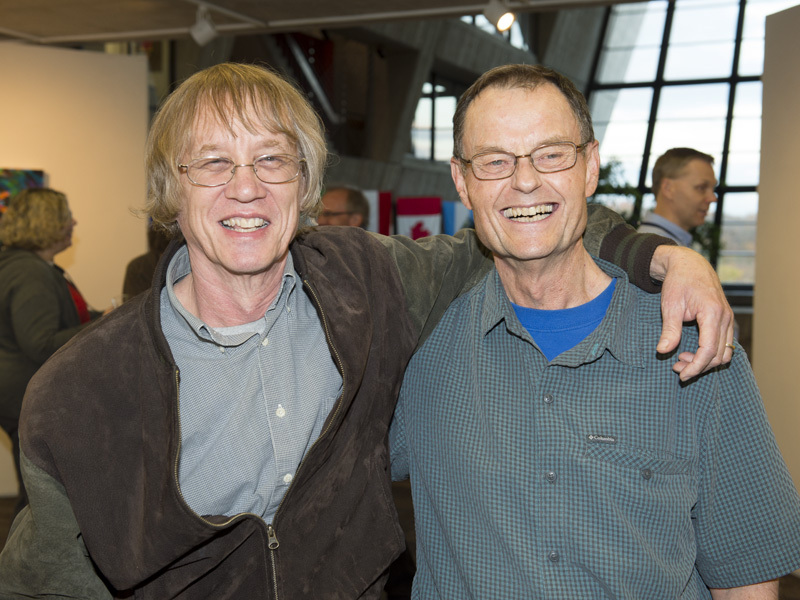 These volunteers are role models and mentors for teachers and students, answer tough questions about Fermilab and its science, maintain Lederman Science Center exhibits, visit area classrooms and more. Once a year at a reception, the laboratory recognizes the efforts of an especially dedicated volunteer with the Director's Award. If you've been impressed by a colleague's education or outreach contribution, let the Education Office know. You may nominate a Fermilab staff member, user or contractor. The Education Office will take nominations until Nov. 6. This year's reception will take place on Nov. 18. Contact Tanja Waltrip with questions. October is a sweet month for the scientific community. That's when the annual Nobel Prize in physics is announced. Tuesday's award — in a pleasant surprise for particle physicists — went to Takaaki Kajita of the University of Tokyo and Arthur B. McDonald of Queen's University in Canada for their groundbreaking research on neutrino oscillations. Neutrinos — electrically neutral subatomic particles — are everywhere in the universe. They're like ghosts of the subatomic world, interacting so little with ordinary matter that they can pass through the entire Earth with hardly a flutter. They are also chameleons that can change their identity, much as if ordinary cats could change into tigers and then lions, before changing back into cats again. The Standard Model includes six types of quarks, arranged into three generations. Only generation I is necessary to make ordinary matter. So why are there three generations, and what message are the other four quarks telling us? There are a lot of mysteries in particle physics, but one of the most curious is called the flavor problem. Physicists use the word flavor to mean the different varieties of particles. As readers of this column will recall, there are six types of quarks: up and down, charm and strange, and top and bottom. Up and down quarks are found in ordinary matter and are called generation I. 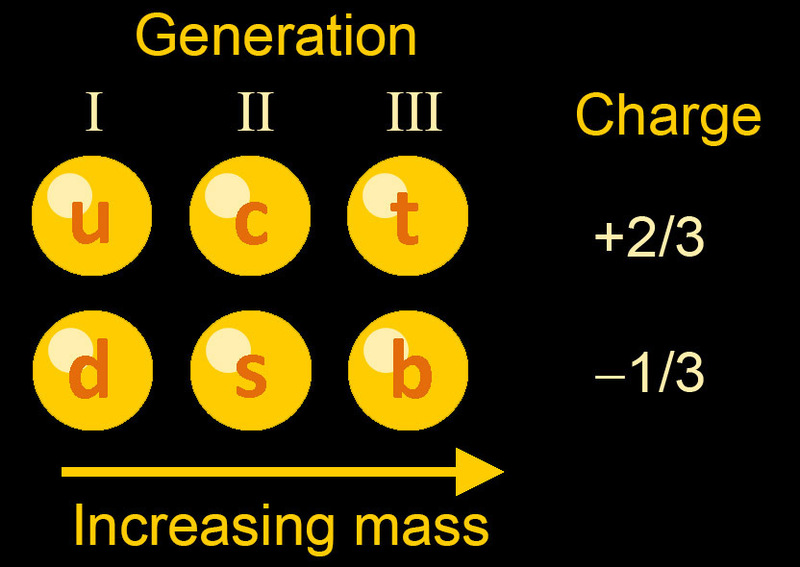 The other two generations are very similar in their properties compared to the first generation, but they have higher mass. So why are there these two other copies? Scientists have many ideas. One is that the quarks contain smaller particles within them. While these smaller particles have never been found, they already have a name — preons. 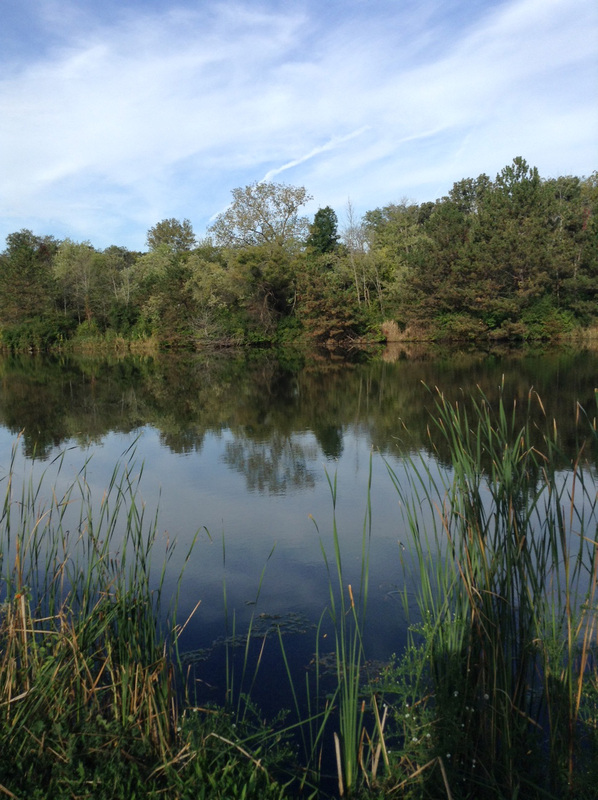 Another idea is that there may be only one generation, but this generation exists in a higher dimensional space. In the same way that a football viewed end on looks like a circle while looking like, well, a football from the side, perhaps the different generations are just a single particle seen from different angles. Nobody knows the answer to the flavor problem, and, to share a personal note, this particular physics problem is the one that keeps me awake at night. The existence of these extra generations would tell us something profound about the universe if we just had the wits to understand what it is saying. Another interesting possibility is that there are other generations, say generation IV. We already have names for the quarks of that generation — t' and b', pronounced "t prime" and "b prime." However, no evidence for the existence of this fourth generation has been found. Indeed, a measurement from experiments from back in the 1990s using the LEP accelerator at CERN suggests that there are only three generations. There are possible loopholes in that measurement, but it might well be that there are but three generations. Yet another idea, generally based on the preon concept, is that the hypothetical constituents of the quarks can be given energy. Just as a slumbering beehive is different from one that was recently kicked, maybe enough energy can stir up the quarks' constituents. In the simplest incarnation, this principle should be true of all quarks, but one could also imagine adding energy only to the constituents of the third-generation quarks. Scientists call such a configuration an excited quark and denote such a quark with an asterisk. So CMS scientists went looking for a b*. The idea is that the b* would be a very massive particle and could decay into a W boson and a top quark. No evidence was found for a b*, and physicists ruled out the existence of a b* with a mass below about 1,500 GeV. A particular peculiarity of this particle is that it wouldn't get its mass from the Higgs field, but from the energy that excited the quark. A negative measurement isn't as much fun as a positive one, but at least we know what's not the answer for the flavor problem, and that's progress. But it doesn't help my insomnia, and so we keep looking, hoping to solve this thorniest of problems. This year's Nobel Prize for physics is a bit of a head scratcher. 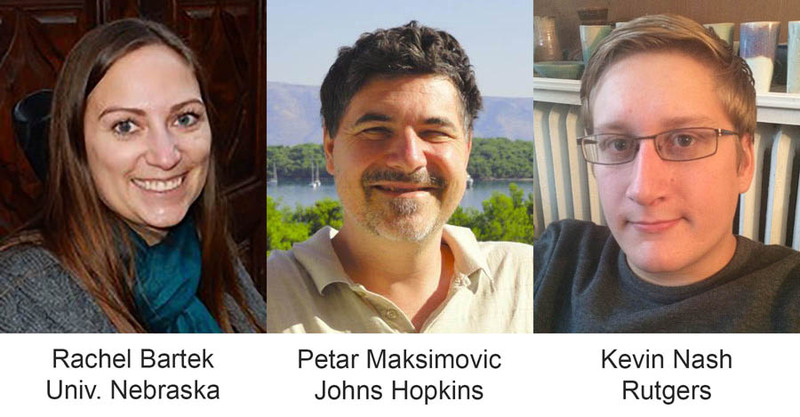 The committee awarded the prize to two scientists, Takaaki Kajita of Japan and Arthur McDonald from Canada, for their work showing "that neutrinos change identities" and therefore "that neutrinos have mass." So what does that mean? Neutrinos have pretty much toppled the Higgs boson as the most exciting particle at the moment. Physicists have known about neutrinos for decades, but unlike the Higgs, which turned out to be boringly predictable, neutrinos keep throwing out curveballs. Walter Weinig begins his new role as Sanford Lab's new Laboratory Director today, but he's already very familiar with the various experiments that make their home on the 4850 Level. "We've worked with Walter extensively through the years on the geotechnical designs for the Deep Underground Science and Engineering Laboratory (DUSEL), the Long-Baseline Neutrino Experiment (LBNE), and, most recently, the Long- Baseline Neutrino Facility (LBNF)," said Mike Headley, Executive Director of the SDSTA. "He's a strong leader and will do a great job making sure all experiments at Sanford Lab can succeed."